Elation struck Philadelphia on Sunday. (Or whatever feeling makes you do these things.) The Eagles beat the Patriots in Super Bowl LII. In the celebration, fans may have forgotten that Bud Light vowed to make good on a preseason bet promising free beer for all of Philadelphia if the Eagles won the Super Bowl. Honestly, it probably seemed like a pretty safe bet when it was made. Before the season started, Eagles offensive lineman Lane Johnson said, "I have a lot to prove to this city... I think if we have a few big years and make the playoffs, if we win a Super Bowl, I'm giving out beer to everybody." 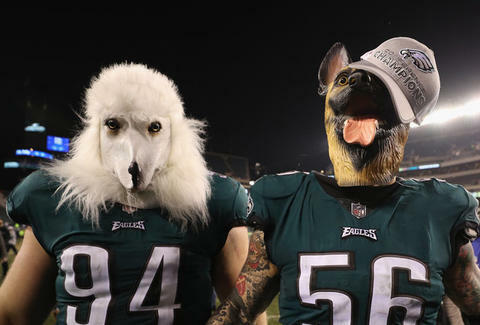 Dog-faced Eagles fans have a long memory, so Johnson should be thankful that Bud Light tweeted a reply to him, saying if the Eagles won the Super Bowl, beer would be on Bud Light. Despite injuries to Pro Bowlers and their starting quarterback, the Eagles just won free beer for everyone... er... the Super Bowl. So, here's the deal. Bud Light is actually going to give out free beer to the fine folks of Philadelphia. Some details are still being sorted, but fans will be able to have Bud Light reps buy them a beer at bars along the parade route. "The Eagles have emerged victorious in Super Bowl LII, where we will celebrate with Philadelphia fans in taverns along 'Victory Lane,'" Bud Light said in a statement. "On the day of the parade, we invite all fans 21+ to join us in raising the Kingdom’s favorite light lager in celebration of the big win. Look for Bud Light reps at multiple taverns along the parade route where we will buy fans one Bud Light. Congrats, Philadelphia! And please enjoy responsibly! Philly Philly!" There's still some vagueness in the plan, but that's partly because the date of the parade hasn't yet been announced. It's "most likely Thursday," Philadelphia Mayor Jim Kenney told 94WIP in Philadelphia. 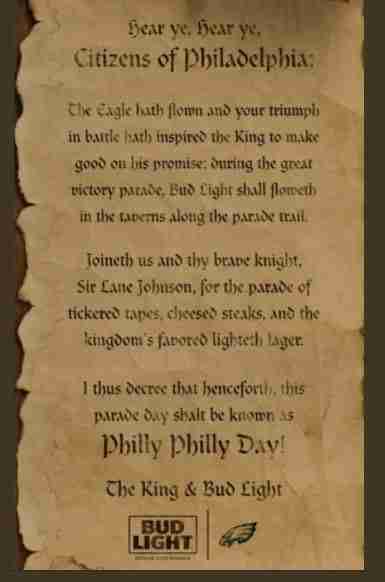 Hopefully, there's still a Philadelphia in which you can celebrate Thursday.